With this charter, granted by Henry when he ascended the throne, the king formally bound himself to the laws, setting the stage for the rule of law and constitutionalism. 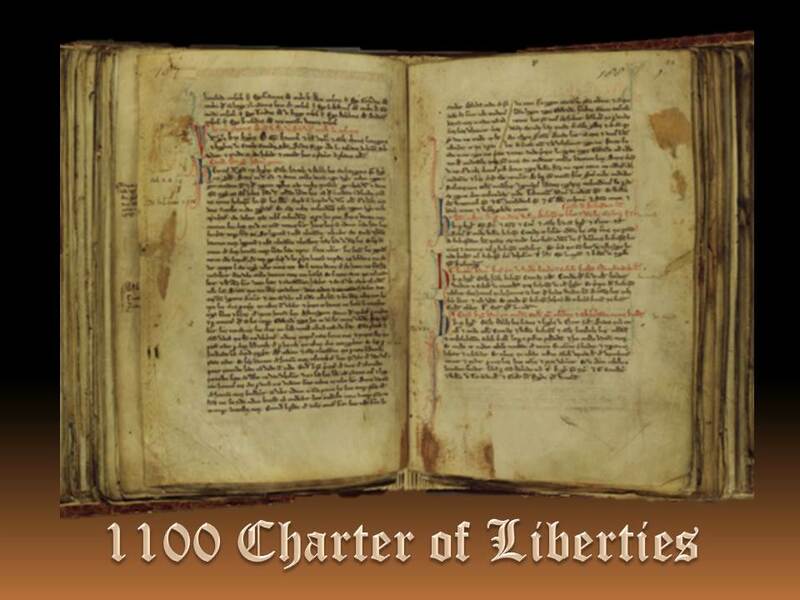 The Charter of Liberties inspired those who compelled King John to sign the Magna Carta in 1215 and served as the model for that great document. If any of my barons, earls, or others who hold of me shall have died, his heir shall not buy back his land as he used to do in the time of my brother, but he shall relieve it by a just and lawful relief. Likewise also the men of my barons shall relieve their lands from their lords by a just and lawful relief. The common seigniorage, which has been taken through the cities and counties, but which was not taken in the time of King Edward I absolutely forbid henceforth. If any one, whether a moneyer or other, be taken with false money, let due justice be done for it. And if any of my barons or men shall grow feeble, as he shall give or arrange to give his money, I grant that it be so given. But if, prevented by arms or sickness, he shall not have given or arranged to give his money, his wife, children, relatives, or lawful men shall distribute it for the good of his soul as shall seem best to them. If any of my barons or men commit a crime, he shall not bind himself to a payment at the king’s mercy as he has been doing in the time of my father or my brother; but he shall make amends according to the extent of the crime as he would have done before the time of my father in the time of my other predecessors. But if he be convicted of treachery or heinous crime, he shall make amends as is just. Witnesses Maurice bishop of London, and William bishop elect of Winchester, and Gerard bishop of Hereford, and earl Henry, and earl Simon, and Walter Giffard,and Robert de Montfort, and Roger Bigot, and Eudo the steward, and Robert son of Hamo, and Robert Malet. At London when I was crowned. Farewell.